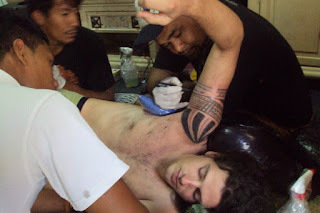 Living in Apia, I get a fair amount of guests staying at my house, I typically always have someone to hang out with on Friday nights, and I get to watch a lot of volunteers get tattoos. Of the volunteers who get work done while they’re here, most go to Tatau Suluape, run by the Suluape family, which operates out of the same building as Magik Cinema. Paul told me last night he planned on getting his tattoo today, and always up for a spectacle, I showed up to watch. 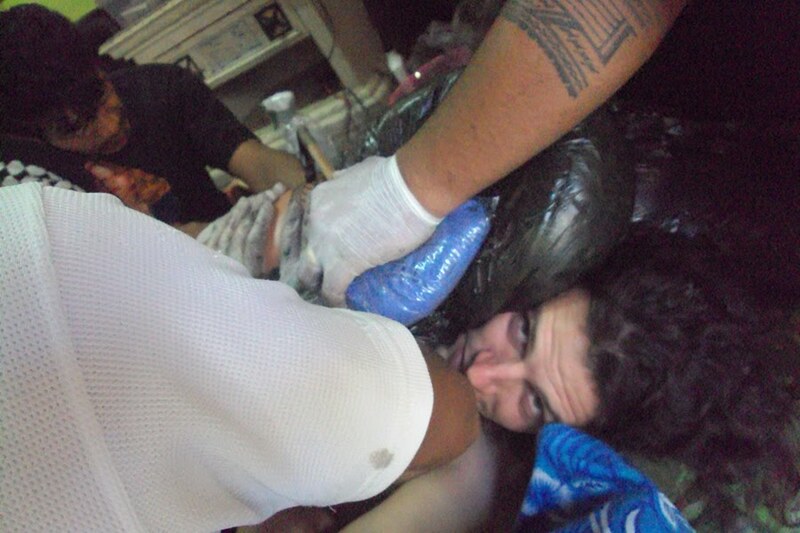 RPCV Sara wrote a particularly good article about the traditional tattoo practice, and I don’t want to re-tread old ground. I will say watching someone get a tattoo the traditional way is more of a spectacle than watching someone get tattooed with the buzzing machine. My roommates and I, on occasion, used to watch “Miami Ink”, which chronicles the clientele at one particular tattoo parlor in Miami. It was interesting, but looking back it seems quite saccharine compared to the literal hammering at Tatau Suluape. The process, on the whole, is more involved. Typically a team of “stretchers” are employed to keep the skin taut. The tattoo artist, who holds the sharp, ink-filled comb and the hammering stick, directs the stretchers like the director on a film set. I was amazed by how, for much of the time I was there, the artist and the stretchers worked in silence, intuiting the next move with almost no verbal communication. The process is methodical, and when everyone is in the zone, they can cover a lot of ground with efficiency. RPCV Trent claimed when he got his tattoo, he slept through much of it. Given the intermittent bursts of hammering, I’m not sure I believe a person could actually fall asleep. On the other hand, drowsiness and slumber seem like the best way to dull the pain; after all, isn’t that why we use anesthesia? Paul, for his part, took it like a champ. His concentration seemed as focused as the tattoo artist’s. Though he acknowledged me when I entered the room, it was brief, and he quickly went back to distantly staring at the mat on the floor. Paul had a crowd of spectators, among them Rachel 82 and her parents, who are visiting from The States, and Dan and his mom, who’s also in town. Rarely does anyone get such a crowd. The group would watch in silence for minutes at a time, and then strike up conversation. And then fall back into silence. It was a little surreal. When it was all over, it felt a little like the end of a play. Paul and the tattoo artist both came out of their focused trance, the air in the room was immediately more light and jovial. 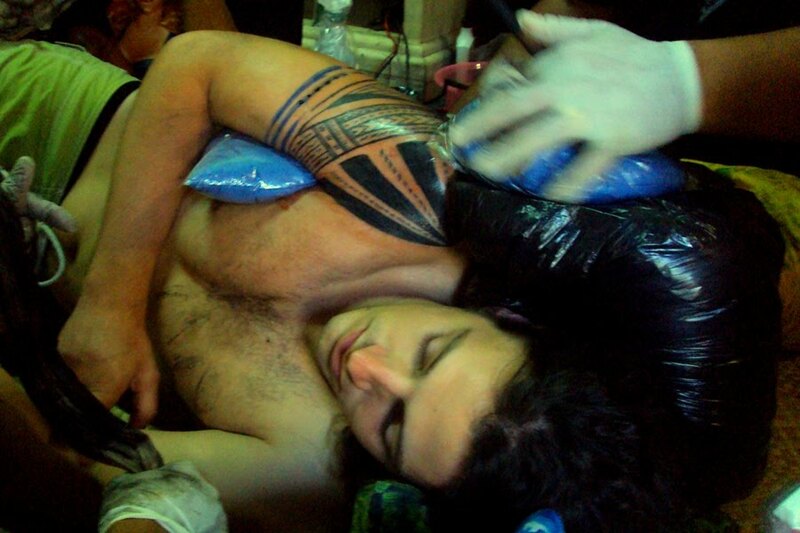 And Paul had a tattoo. Pretty cool. Paul smiling for the camera. The artist marks the arm. 'Just got back in town. I sure was lucky to watch the tattoo process up close and in person. The bonus head whacking also spices up the show. I saw quite a bit of that this time around.